Viola Davis Is First Black Woman To Win Emmy For Best Actress In A Drama : The Two-Way Jon Hamm won best actor in a drama for his work on Mad Men, the first acting Emmy ever awarded to the critically acclaimed show. Veep and Game of Thrones won the best comedy and best drama categories. 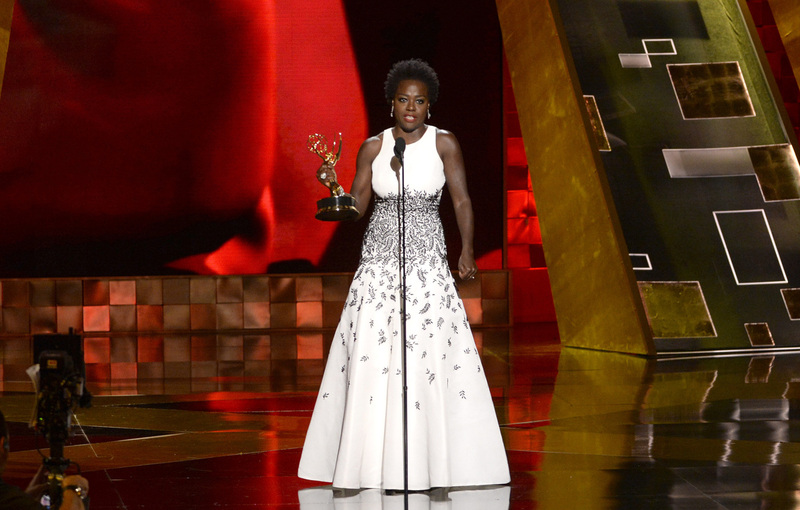 Viola Davis accepts the Emmy for outstanding lead actress in a drama series for How to Get Away With Murder at the 67th Primetime Emmy Awards on Sunday in Los Angeles. When Davis' award was announced, Taraji P. Henson — nominated for the same award for her work on Empire — gave Davis a fierce hug and a one-woman standing ovation. NPR's Eric Deggans wrote earlier this week that a win by either Davis or Henson would be a first "basically because black women haven't had many starring roles in TV dramas until recently." For those in my mentions re: Davis' quote: When Scandal debuted in '12, there hadn't been a single drama starring a black woman since '74. "The only thing that separates women of color from everyone else is opportunity," Davis said in her acceptance speech. "You cannot win an Emmy for roles that are simply not there." In other categories, John Hamm — nominated 15 times for his work on Mad Men -- finally won a statue, for best actor in a drama. His is the first and only acting award ever granted to the critically acclaimed show. Jill Soloway, the creator and director of Amazon's Transparent, and Jeffrey Tambor, the star, both won for their work on the comedy show. Allison Janney earned her seventh career Emmy — best supporting actress in a comedy, for her role in Mom. That many acting Emmy wins ties her with Ed Asner and Mary Tyler Moore, right behind Cloris Leachman's record of eight. Julia Louis-Dreyfus won best lead actress in a comedy for Veep. Statues aside, host Andy Samberg launched the evening with a musical number that mocked the sheer quantity of television produced these days. His opening monologue touched on politics — mocking both Donald Trump and Bernie Sanders, and taking a dig at Kim Davis — before riffing on the nominees. Toward the close of the show, Tracy Morgan, seriously injured in a crash more than a year ago, walked out on stage to present the award for best drama series to Game of Thrones. Morgan — who suffered a traumatic brain injury in the June 2014 crash, which killed comedian James McNair — thanked the crowd for their prayers and good thoughts. He also demonstrated he was feeling like himself again by vowing to impregnate "a lot of women" at the afterparty, a joke that delighted a crowd already moved by his very presence.